Made by Stanhope, Charles, c 1825. The Stanhope printing press construction consists of a cast iron frame standing verical upon a 'T' shaped wooden base. The press has been secured into place by two metal bolts. The platen sits beneath a metal slide which is set vertically inside a groove between two the vertical bars of the frame. This is counterbalanced by a heavy weight behind the press. The iron carriage moves along a horizontal table. The end of the table which the carriage moves along is held up by a pillar on the wooden base. inscribed along upper frame "STANHOPE / INVENIT / No 429 / WALKER / Fecit"
The first all iron printing press, the Stanhope was invented around 1800 in England by Charles, the third Earl Stanhope, who devoted his life to science and technology, and especially to attempts to improve the techniques of printing. Stanhope did not patent the press himself but engaged Robert Walker, an ironsmith of Vine Street, Piccadilly, London to manufacture it. Thus this press bears the inscription STANHOPE INVENIT and WALKER FECIT. 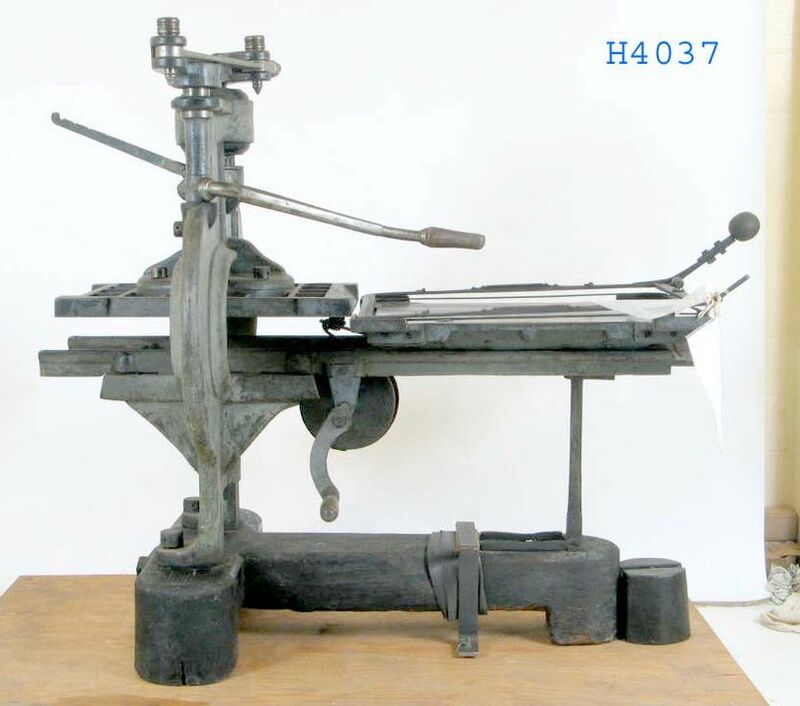 This press was found inside the New South Wales Government Printing Office in 1897 by Government printer William Applegate Gullick.